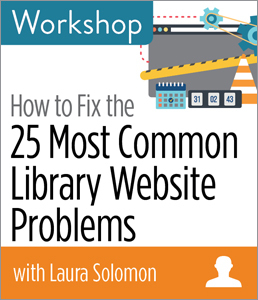 CHICAGO—ALA Publishing eLearning Solutions announces a new session of our popular workshop, How to Fix the 25 Most Common Library Website Problems with Laura Solomon. This workshop will last 90 minutes and take place at 2:30pm Eastern/1:30 Central/12:30 Mountain/11:30am Pacific on Wednesday, Dec. 6, 2017. Thought that rotating carousel on your website looked cool? What about that vendor widget? There are all kinds of issues with various features commonly found on library websites, and in this workshop, you’ll learn about the 25 most common ones. You’ll discover not only the inherent challenges your patrons may face with these issues, but you'll also learn ways to fix those issues, and even rate how hard those fixes are. You’ll leave this event with a wealth of data and ideas that you can use to make your site more user-friendly and accessible. Laura Solomon, MCIW, MLS is the Library Services Manager for the Ohio Public Library Information Network. She has been doing web development and design for twenty years, in both public libraries and as an independent consultant. She specializes in developing with Drupal. She is a 2010 Library Journal Mover & Shaker. She’s written three books about social media and content marketing, specifically for libraries, and speaks nationally on both these and technology-related topics. As a former children’s librarian, she enjoys bringing the “fun of technology” to audiences and in giving libraries the tools they need to better serve the virtual customer.